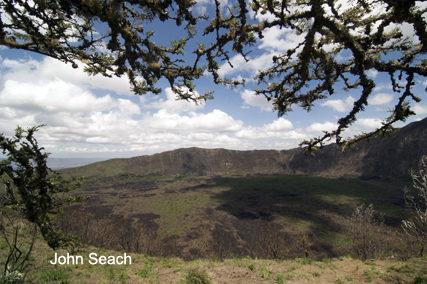 Longonot volcano is located 100 km west of Nairobi, and SE of Lake Naivasha in the Kenyan rift valley. It is at the southern end of the Naivasha trough. The Mau Escarpment in the west is faulted. Longonot is located between the rhyolite dome field of Olkaria, 20 km to the north-west and the phonolite-dominated Suswa, 30 km to the south. 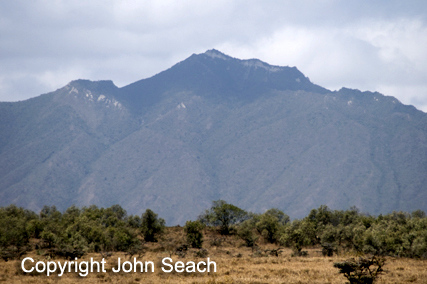 The summit of Longonot is on the rim of a small caldera surmounting a prominent lava cone. The floor of the Kenyan rift attains its maximum altitude (2000 m) between Longonot and Menengai. 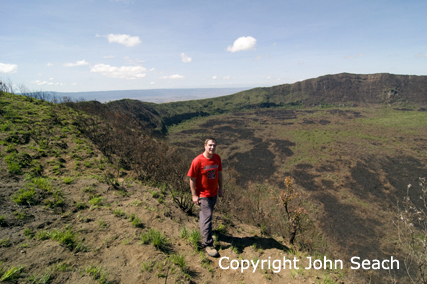 John Seach at Longonot volcano crater 2009. 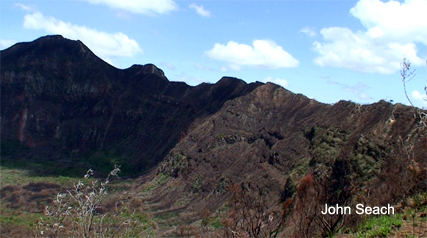 An early composite volcano formed with a diameter of 30 km. Caldera formation (up to 12 km diameter) was followed in the later stages by pyroclastic flows, base surge, and ash eruptions. Deposits from the eruptions almost infilled the caldera. Lava flows were then erupted onto the northern slopes, followed by asymmetric collapse of the summit region to form a circular pit crater 1.8 km in diameter. Lava was erupted onto the pit crater floor, and northern and southwestern slopes of the lava pile. Lava flows on the northern flank occurred around 1863. In the mid 20th century 30 fumaroles were reported at the volcano. On the northern flank there is a well preserved parasitic cone and recent-looking lava. 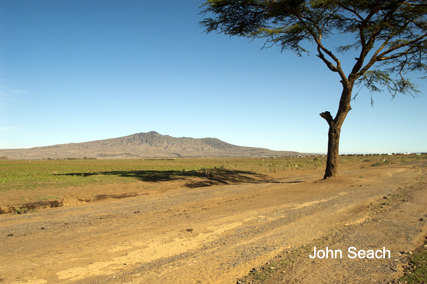 Rumours emerged in May 2012 that Longonot was ready to erupt. Local newspaper stories quoted resident noting a 5 km long, 25 ft deep trench opening on flank of the volcano. A geologist from University of Nairobi recommended that residents evacuate from a 20 km radius. Residents noted the earth sinking and making noises like a bang. Water started filling the fissure which was reported to cut a house in two. A later report said the fissure may have been caused by heavy rain. Geologists later visited the National Park at Longonot and stated the fear of an eruption was a false alarm. 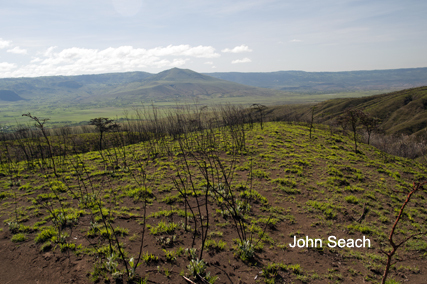 More than 4,600 hectares of bushland on Mt Longonot were destroyed by bushfires in March 2009. Some larger animals escaped, but smaller animals in the crater may have been caught by the fire.